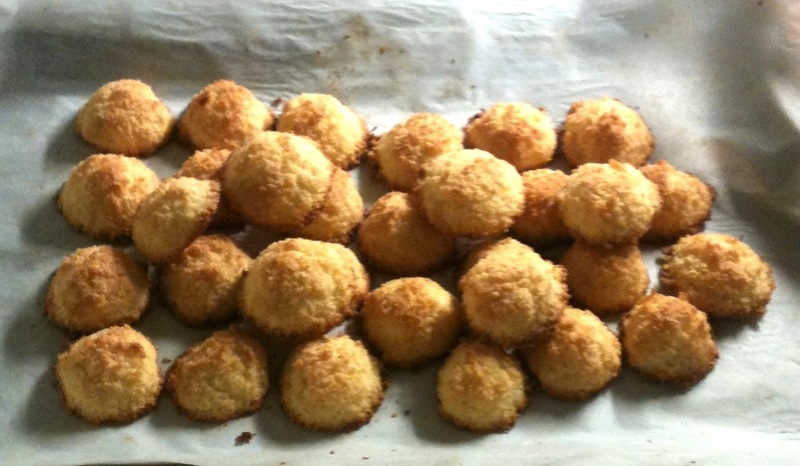 Coconut cakes, or kokostoppar or kokoskakor in Sweden, are festive small cakes that I usually make for Christmas. They're super easy to make and take very little time to prepare. In almost 30 min you could have them done! 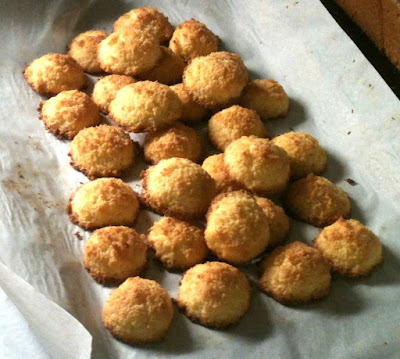 They're great as small dessert with coffee or tea, and taste great :-) They're crunchy outside and soft inside. In a bowl mix eggs and sugar. Add coconut, mix and then add melted butter, and mix. Let the mix sit for about 15 min so the coconut swells a bit. Place parchment paper on an oven plate. Make small cakes of the coconut mix with 2 spoons (they're meant to be eaten as bites). Bake in the oven 10 min at 175 C.
Make sure the cakes are detached from the parchment paper before they cool down.